Today, to my complete surprise, it snowed! The weather forecast had originally called for a cold, cloudy, windy day with a slight possibility of snow flurries. I was happily going to stay inside and catch up on some office work. However, upon seeing the ground covered in a few inches of fluffy snow and the sun starting to peek through the clouds, I knew that I couldn't pass up the opportunity for some snowy landscape photography. I decided to head out to a local nature area, Prairie Center, here in Olathe. It is a short drive away and provides several different types of landscapes to shoot in a relatively small area. With my destination in mind, I grabbed my gear, put on as many layers of clothing as possible to combat the sub-zero wind chill, and headed out the door. Long story short, I struggled for quite a while to find the right composition. There are a few old, stone walls scattered around from the days that the land was a farm, and the snow that settled on the jumbled rocks was beautiful. The surrounding terrain, however, did not lend itself to a flattering photo. Later, I spotted an old piece of rusty farm equipment that I thought would make a great shot, but I couldn't make the light work for me. I tried another few more shots at a small fishing lake further down the trail, but for a variety of reasons, they didn't turn out either. Another location centered around an old, fallen tree again resulted in nothing satisfactory. At this point, I will admit, I was getting a little frustrated, but had one last idea for a good location. At the bottom of the hill, a small creek ran across the trail, and during winter, it often left interesting icicles on the rocks. When I arrived at the creek, I was at first disappointed not to see much ice, but looking down stream, the water was gently meandering around dozens of snow-covered rocks. This looked promising. After a lot of trekking up and down the creek for about an hour, trying several different angles, lenses, and even camera bodies, I finally got a shot that I was happy with. After that, I left for home. So, with that in mind, do I consider today to be a failure? I spent hours this afternoon hiking a few miles in inches of snow, hauling thirty pounds of gear in icy wind. By the end of the shoot, my tripod feet were frozen and couldn't be adjusted. In fact, my own feet were wet and were on their way to becoming frozen too. My pants and shoelaces were ice-covered at any rate. I got back to my car sore and exhausted, and all for one image. But do I consider today to be a failure? Absolutely not. If I could go back out tomorrow and do the same shoot, I would in a heartbeat. Most of you have to be wondering this. Is it because the image I captured is the best photo I've ever taken? No, definitely not. Frankly, I don't even think it comes all that close to the best image I've taken yet in 2018. Was it because photography was particularly easy today? Absolutely not, did you read the first part of this blog post? I struggled more today with photography than I possibly ever have. What made today a success, in my mind, is that I rose to the challenge of the elements and practiced photography. The thing I love most about nature photography is the nature. Getting outside and exploring a new place. I had not planned on going outside today, but thanks to even the thought of getting some decent photos, I spent hours getting fresh air, stretching my legs, and enjoying the scenery. As I was hunting for the right spot to take a photo of the creek today, I stopped for a few minutes, and just took in the moment. That secluded, snowy creek was absolutely stunning. I felt alone in the world with only the birds for company. Dozens of robins were flying around downstream, chirping happily as if it were a warm day in the middle of spring instead of one of the coldest days of winter. Other than my own footprints, the snow around me was untouched. It was entirely peaceful, and even if only for that moment, I was glad to have ventured outside today. On the flip side, I also loved the challenge of today's photography outing. The entire landscape was beautiful today, but a beautiful view doesn't always translate to a great photograph. That fact was certainly true throughout the beginning of my shoot today. However, I was determined to make something work. Even once I found my subject, the quiet, snowy stream, I had a lot of work to do, and it pushed me both mentally and physically. I had to think about possible compositions, and then move to the proper position without disturbing the patches of snow that I wanted to photograph. 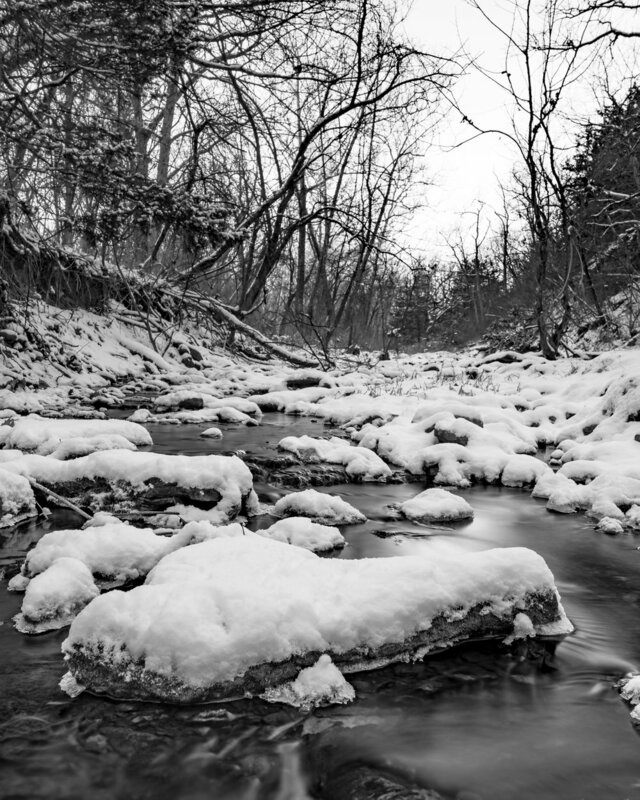 This meant considering an angle of view very different from what my eye sees, and then walking through an ice-cold creek while wearing a heavy backpack to get into position and set up a half-frozen tripod. Almost every time I got set up, I realized that there was a better angle a few feet away, requiring me to start the process over again. Even once I found the final location that I wanted to photograph, the result wasn't quite what I wanted. Among other various changes, I had to pull out a different camera and lens so I could use a neutral density filter to get a slower shutter speed, making the water look silky smooth. The hour that I spent attempting to photograph that stream was some of the most intensive work that I have ever done. That may sound silly, but it is true. This combination of both finding peace and working hard is incredibly satisfying, and it is why I love photography. Even if I had been completely unsuccessful today in producing a single photo, it would have been worth my time to go out and try. That being said, I am very happy that I was able to get this shot and share it with you. I hope you enjoy.